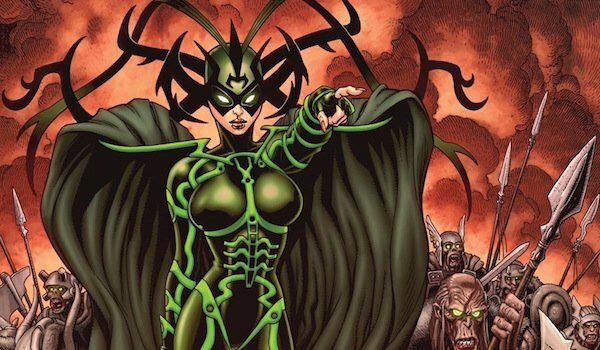 Comic Book Backstory: Who Is Hela? For millennia, the human race has been in conflict with its greatest fear: death. Fearing it would be the inevitable end, many mythologies across history came up with theories as to what would happen to the souls of the dead and where would they go. Among them was the Norse Mythology who came up with two possibilities: Valhalla, the promised land for those who had died in battle, and Hel, the nightmarish realm where the rest of the souls would go to. And for this hellish realm, there was an equally hellish ruler, the Norse Goddess of Death herself: Hela. 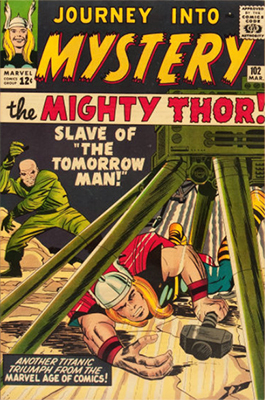 Hela is based off the character of Hel from Norse Mythology and made her first appearance in Journey into Mystery #102, created by Stan Lee and Jack Kirby on March 1964. Hela is believed to be the offspring of Loki, The God of Mischief and Thor’s adopted brother, and the sorceress giant Angrboda. When she came of age, the Almighty Ruler of Asgard Odin deemed her the Goddess of Death, giving her domain of the souls of those who had passed away, and he also gave her the domain of two of the Nine Realms: Hel and Niffleheim, to where the dead would go. But Odin still held power over the souls of all the Asgardians as well as the mortals who had perished in battle, which he would keep in in the palace of Valhalla, in Asgard. With her thirst for power, Hela sought to take control of all the souls in Valhalla as well as those destined to go there. 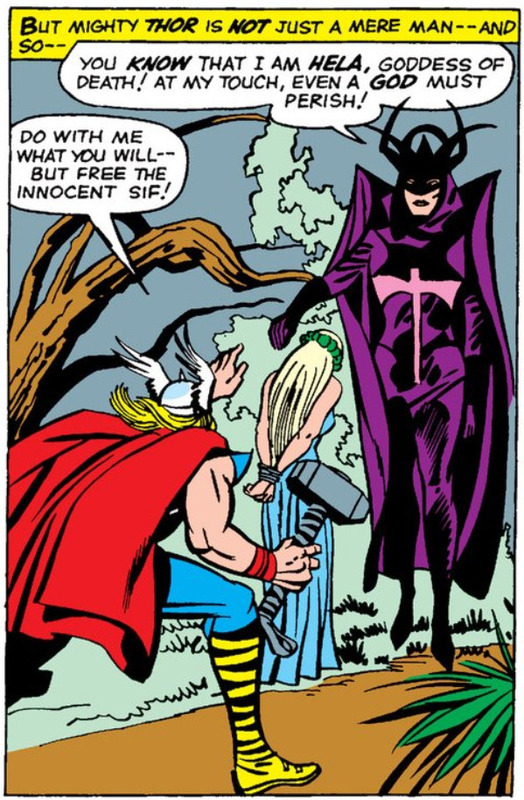 Her first appearance, in a segment part of a series in Journey into Mystery called Tales of Asgard, recounts her first encounter with Thor, which was the first time he completely lifted his hammer Mjolnir. When trying to rescue Sif after she’s ambushed by the Storm Giants, he encounters her in the realm of Hel, where she offers Hela his own life in Sif’s place. Impressed by his courage and nobility, Hela sets Thor and Sif free. Their first encounter in the present is when Thor is driven to the edge of death by the human supervillain The Wrecker, but he managed to defeat him. From then on, Hela would make numerous attempts at taking the souls of the Asgardians, especially Thor and Odin. She managed to take part of Odin’s soul, creating the being known as Infinity, which took over Odin’s body. With this, she managed to kill Thor, but, due to a sacrifice made by the entity known as the Silent One, Thor was resurrected. Odin took back control of his body and killed Hela, but she was later resurrected to restore the balance between life and death. She later killed Thor again, but he was brought back to life again when Lady Sif offered to take his place. She would also make attempts to steal the souls of many heroes such as Wolverine and the Avengers. In her quest for power, she has allied herself with other powerful beings who held domain over the dead, such as Pluto, the Olympian God of Death, Mephisto and Dormammu. 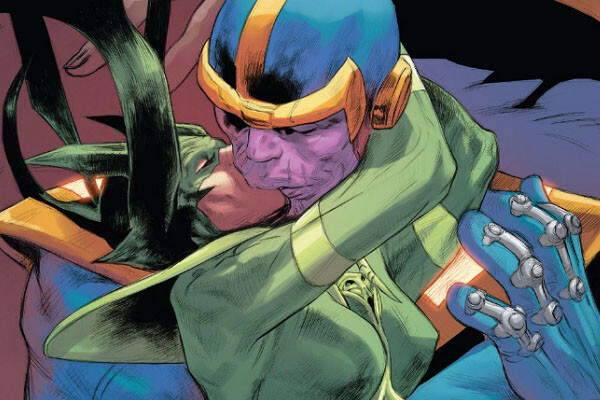 Most recently, after failing a mission given to her by Thanos, she sought his alliance by giving him the gift he most desired: death. The two became romantically involved ever since. 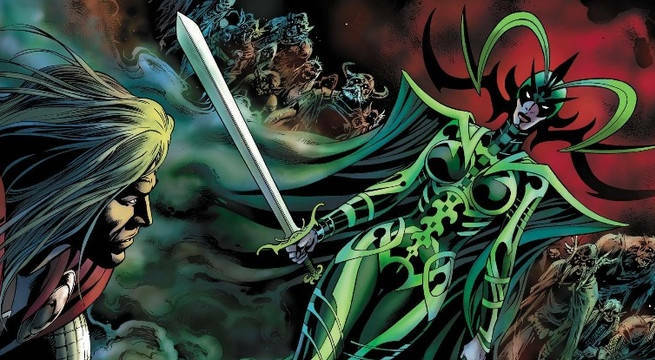 As a Goddess of Asgard and ruler of the dead, Hela possesses many powers and abilities which include superhuman strength (equal to the likes of Thor’s), speed, durability and healing and, as an Asgardian, she has a long longevity. She also has many magical abilities such as energy manipulation, astral projection and most importantly she has control over life and death, with her touch being fatal to regular mortals. She possesses a magical cloak, the source of her power, without which half her body becomes dead and decayed, and her mystical sword “Nightsword”. She is also a skilled swordswoman and hand-to-hand combatant. Her powerful presence has made her appear in many forms of media outside of comics, such as cartoons and video games and the animated direct-to-video film Hulk vs. Thor. And within less than a month, she will be played by non-other than the Academy Award-winning actress Cate Blanchett in the MCU’s new installment Thor: Ragnarok, which will be released on November 3, 2017, and will be directed by Taika Waititi. The film stars Chris Hemsworth as Thor, Mark Ruffalo as the Hulk and Tom Hiddleston as Loki. And from the looks of the trailers, she might prove a worthy adversary to Thor like in the comics. Did you like this article? And what more would you like to learn about this villainous Goddess? Let me know in the comments below and stay tuned for more about the new characters coming to Thor: Ragnarok. And for more Marvel-related articles, be sure to follow Geek Motivation (@GEEKMOTIVATION) and me (@Miguel420Coelho). ‘Till we cross paths again, fellow mortals! Pingback: Comic Book Backstory: Who Is Valkyrie?